As you can imagine I was a bit taken aback but that wheel and a new set of legs to take time out of Tom Mulqueen could put me on track for the De Ronde van Cork cycling club TT (Yes ! 1 down). It was time to bundle ourselves back into the campervan which still contained a copious amount of muck from the previous weeks ‘Fissure’ (remember the Fissure?). Our departure from the UpperChurch Drombane CC (2nd club mention!) event would have been worthy of a Benny Hill movie. The stars were AJ Murphy, John Carey and Will Rock. Each took part in an animated high-speed chase slipping and sliding down the boggy field, climbing in the side door before we became stuck in the quagmire. When I suggested that the training might help their performance in this week’s event they did not see the funny side but I suppose I was ensconced in behind the wheel and my close encounters with the muddy terrain finished earlier that day. Today it was just Sam and me. Neither of us was really enthralled with the idea of a 7am start of a Sunday, remaining in a warm cosy bed did have a certain appeal. Anyway, there I was prostrate, immobile, thinking about the about the day ahead and whether I should take an energy gel to get me out of bed. 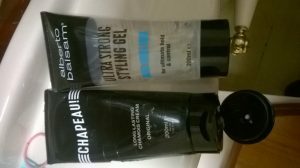 Thoughts of my recent mishap with the remarkably similar tubes of hair gel and chamois cream sprung to mind so I adopted a different plan of attack. We’d just have to rouse ourselves up and get to Aghadoe Hostel, home of Killarney Cycling Club’s (3 down!) K Cross. Aghadoe Hostel conjured up fond memories of a prehistoric cycling holiday for my 16th birthday. What I remember most is the startled look of my cycling companion as he shot past me on a wooded descent (I knew a shortcut out of the Black Valley, I thought) holding two pieces of snapped handlebar. Poor Bren O’Regan, had to hitchhike home wearing the full Systéme-U gear. Today too was a day for wooded descents, inglorious dismounts, destruction of bicycles and reputations, as well as 16 year olds. 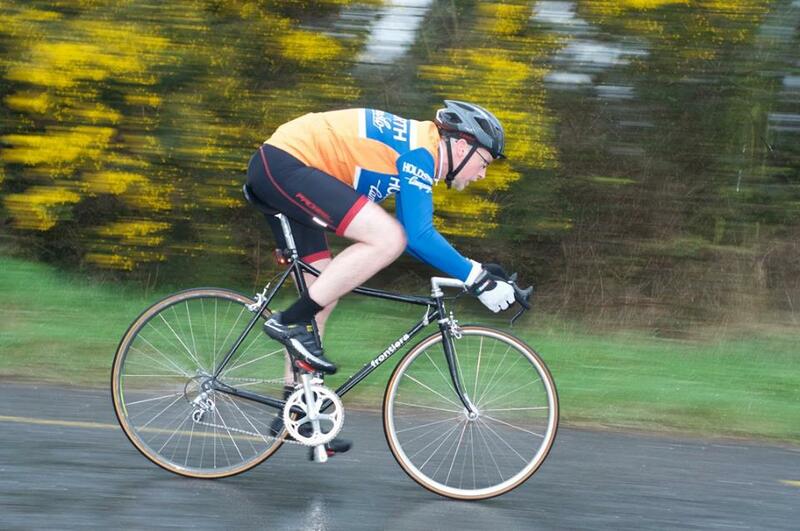 For even younger riders, like Sam, there was 1, 2 and 3 laps of the junior race. The course included a tricky slippery wooded section complete with roots. It was great to see the medal winners strut their stuff later in the day, but I had a reminder too of how important it is to medal all. Poor Sam, probably out of bed first that morning was 5th not a great position in a five-person race. His face said everything! Here at the seventh and final race of the series it was hard to say who was going to be left in the category B race. So many had ascended to the A race that it may be time to reclassify the B race as being for those who were willing to compete rather than just being for beginners and MTB’s. Many of us had ‘B raced’ our way through 2016 and 2017. 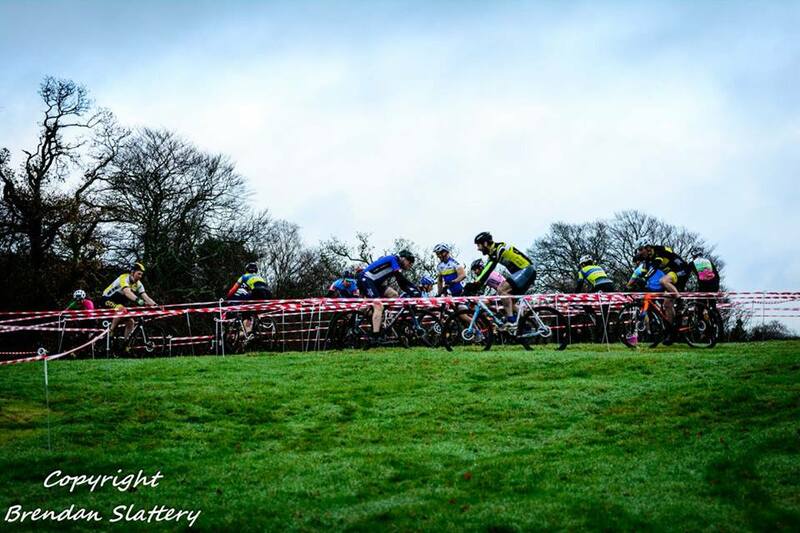 By representing our clubs like Burren Racing Team, St. Finbarrs, Clonmel CC and Revolution/Pi Cycles (see what I did there Ed, all done now) our participation, even in the B Race, could contribute to the overall club standings or even give rise to a league of our own. This is something I may suggest along with restating my thanks to Micháel Corkery, Russel Treacy, John Coakley, John Dempsey, Jerry Ryan, Richie Maes (at this rate you might as well throw in a tub Ed.) and all the other volunteers of the CX league. 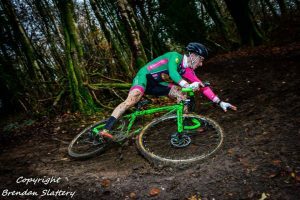 Ah feck it, I’ve mentioned enough of them by now, time for a proper CX blog, beginning with a reminder of last week’s light entertainment. During a lull in the Late Late toy show my youngest announces “DADDY, you’ve got DIRTY pictures on your phone!”. There was a slight pause, leaving just enough time for me to compose a reason why and explain to my wife, when the she added “of BIKES”. A week later I was still picking out pieces of the Co. Tipperary countryside from my bike and while I am proud to have survived ‘The Fissure’ I was still bemoaning my ‘back of the pack’ fate. MCTC club mate ‘AJ’ had suggested a new strategy for today’s race. Pick one rider out and try to stay with them for the duration of the race. I had an even better idea, if I pop a gel and start near the front I might get a lucky break. This is an entirely legal tactic and surely would work better than my recent experiment substituting hair gel for chamois cream. The pre-race chat had as usual been about tyre pressures. As always the choice was 30psi versus 40 psi. My conundrum was different; the choice of which vintage bike to ride was based on the width of the tyres. Should I use 30c versus 35c tires? The bigger tyre would be crucial to not getting bogged down in the large grassy field. Later I discovered there was as much adhesion on this surface as you would find on a velodrome. The Commissare announced the four laps would start on the whistle. I watched as he sucked in his cheeks and then the anticipated sound of his ‘Acme Thunderer’ (the whistle of choice of the most experienced Commissaires). We were off! 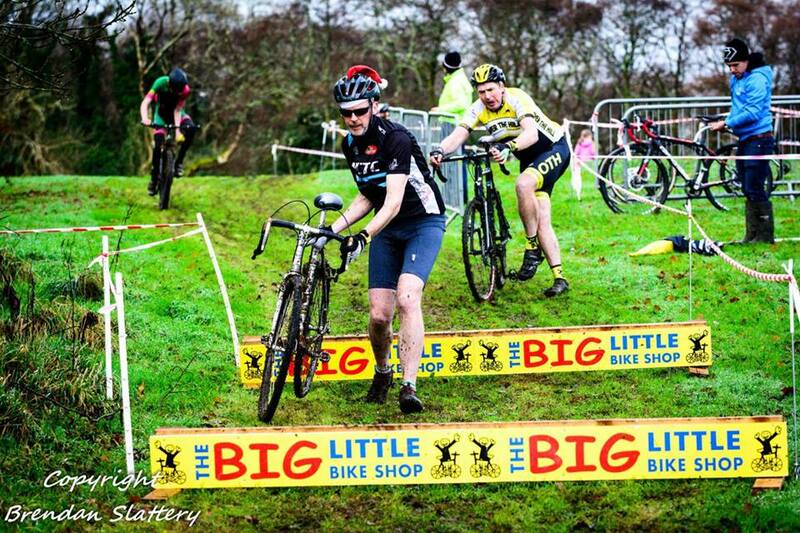 I was well positioned in the front line with my chain on the middle sprocket. A good start and I kept my place, about seventh as we departed. Past the fence, drop a sprocket, faster. Up to the old paddocks of Aghadoe House, keep on the pressure. Swing left, concentrate, avoid the badly parked 4×4 (hope he knows a good panel beater). Along a rocky road, maintain pace. I am going well, keep focused. Take the next left wide, first mistake, two riders get past. Not my fault, just lack of confidence in my bike. Keep focused….. Get through the fieldwork and through John Crowley’s crop circle inspired maze. Don’t listen to my legs. Stick to the pace. My head feels dizzy from the close quarter riding. I am on an ‘up’. Damn, that didn’t last. I was passed by the first of the sixteen year old boys. Magnanimously I didn’t wish for his bars to break. The Killarney lads threw in a ramp down here. Temptingly low it demanded a bunny hop. Some were successful, not me. Steady the mind for the oncoming rise which hid its fall. “Eamonn, may I?” I asked “I’m going to ride it”. Up and over. Mid air for some seconds, flying. Thump, back on terra firma. “Fair play, did you know what was on the other side?” Sweeney inquired. Shock, my conscious self remained mute in disbelief. I did it without falling off! Next challenge. The event sponsor, the Little Big Bike Shop’s wood work. More like light forestry than lumberjacking. The heavy lifting would come later. In fact, let’s go straight there knowing I was never going to make much of boards back fieldside anyway. Listen to the noise from the crowd hanging around the pits. Has to indicate another challenge. The 4 foot dip meant a spectacle was coming up. Not enough blood for the baying crowds. Roars of encouragement for the Gladiators mounted on mechanical steeds. Encourage them and watch them fall. 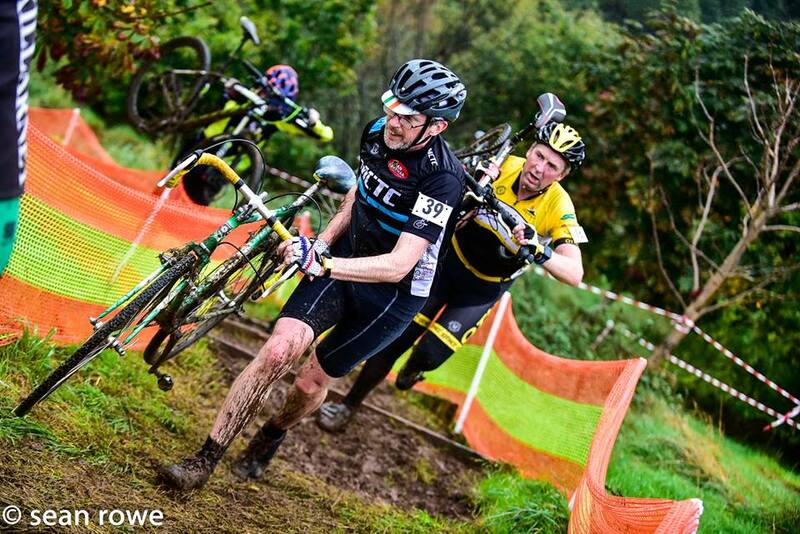 ‘Believe in the bike’ I said to myself and guided 36 years of ALAN cyclocross engineering down into ‘The Pit of Hell’. Brake levers are for holding onto and certainly not for pulling. The 35mm front tyre absorbed the shock of tree roots and wall top. Enough momentum to get on top and not fall off. Clear the mind. It’s all about balance. Along the wall-top and onto the next corner and the crowd were still hungry for blood. “Take your foot out Daddy” I heard my junior counsel say. “Get on with it you old-git” said Brendan Judge Coakley and jury. Take counsels advice and swing the bike downhill. Lift and deposit the rear wheel in some foliage with a foot out for balance for as long as decorum decreed. 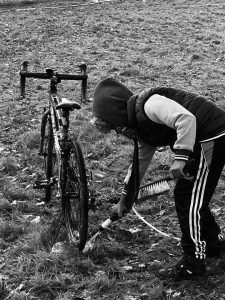 There isn’t a 10 year old in Ireland who wouldn’t have loved what came next, a long slippy, slidy descent which beckoned both wheels, but in different directions. There isn’t a mother of said 10 year olds who would not have been horrified at the metal pole and boulder combo through which the riders must glide. And there wasn’t a 50 year old happier than John Carey who later snapped gleefully at the woe betide. There were many approaches to taking this ungodly turn, at speed, slow, wheel locked, wheels in full flow, around it, through it, into it, over it. With a grunt, with good humour, on your bike, on your bum, to the sound of ‘do you want a cup of tea’ or ‘Up ya boyo’. Once through, you were nearly home. A little more wood work brought you back to the junior track and the entrance road. 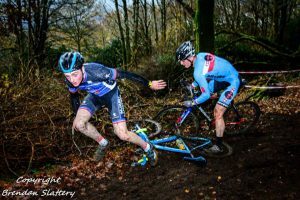 Here, music pumping, came the shout “Go on OldVelo, Keep it Retro” and with that as Richard Cleverly beat Craig Moynihan for the prize and Pat McHugh et al beat me, the Munster B-race CX league came to a close. Why is this Mavic derailleur revered by Irish Cyclists of a certain age?